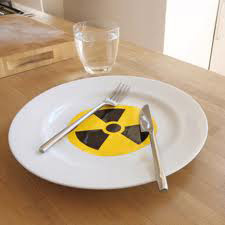 Australia Silently Stopped Testing of Food Imports http://fukushima-news-en.senmasa.com/post/112680359130/australia-silently-stopped-testing-of-food-imports [Mathaba News Network]Australia has ceased all testing of food imports from Japan, other Asian countries food also contaminated, ongoing leakages from Fukushima nuclear plant The north Pacific Ocean is already contaminated by large amounts of toxins and pollution from dumping . As the intergovernmental panel on climate change comes out with a compelling new report, Australia’s nuclear lobby renews its pressure for nuclear power. Of course, Michael Angwin and the nuclear lobby are a bit handicapped in this. Australia’s Prime Minister, puppet of both the fossil fuel and nuclear lobbies, has gone all out to please Big Coal, by promoting climate change denialism. “……...The Environment Protection and Biodiversity Conservation Act 1999, for example, states that the minister must not approve the construction or operation of a ­nuclear power plant. Such prohibition is unwarranted. Tell that to the Japanese, and to the world’s insurance companies! Increased scrutiny needed as EPA radioactive rubber stamp fails the nuclear test National and state environment groups have called for a dedicated public inquiry into plans for increased uranium mining in WA following an EPA recommendation to conditionally approve the proposed Kintyre mine next to Kalamilyi National Park in the Pilbara. “The proposal to mine uranium five hundred metres from a creek system that is part of a network of significant waterways in a national park is reckless and should not be approved,” said CCWA campaigner Mia Pepper. “This polluting plan would put great pressure on one of WA’s special places – our largest national park – and would impact on scarce water resources and a number of significant and vulnerable species including the bilby, marsupial mole and rock wallaby. The approval recommendation follows recent disturbing allegations that former mine owner Rio Tinto made secret payments of around $21 million to silence Aboriginal concerns and opposition while it negotiated the project’s sale to current owner Cameco. “Uranium mining is a high risk, low return activity where the proven risks far outweigh any promised rewards,” said ACF campaigner Dave Sweeney. “Uranium is currently trading at US$28/lb. Cameco has stated it will not mine unless the uranium prices reaches upwards of US$75/lb. The EPA is recommending a green light for yellowcake when the company has stated the finances and the plan don’t stack up. Toxic sites in Adelaide’s suburbs number in their thousands BRAD CROUCH THE ADVERTISER JULY 22, 2014 THE Opposition has demanded a statewide audit of contaminated sites, as it emerges the dangers of trichloroethene entering groundwater was suspected as far back as the 1940s. The call for an audit comes after Environmental Protection Authority chief executive Tony Circelli confirmed that “thousands” of sites were contaminated with various chemicals and the EPA received about 100 new notifications each year. The State Government and Environment Minister Ian Hunter are under increasing pressure over the contamination scandal in Clovelly Park , where dozens of people have been forced to leave their homes because of health risks from the vapours of trichloroethene (TCE) rising up through the soil from industrially poisoned groundwater. Mr Circelli, was responding to a claim by UniSA Professor Ravi Naidu, the managing director of the Cooperative Research Centre for Contamination Assessment and Remediation, that there are about 4000 contaminated sites in SA. Mr Circelli said that claim was incorrect, but conceded the number “is in the thousands”. Opposition Leader Steven Marshall said an audit was needed to clarify the exact number of contaminated sites and their locations. “The purpose of conducting a statewide audit would be to establish a hierarchy of sites based on potential public health risks,” he said. As of today, Queensland has lifted a 32-year ban on uranium mining. That decision was taken within months of the 2012 state election, despite Premier Campbell Newman’s pre-election promise not to restart mining the radioactive mineral. Miners are being invited to apply to restart the industry under the Queensland’s government’s uranium action plan, which will mean Canadian company Mega Uranium can reopen the Ben Lomond and other mines in north Queensland. Queensland’s resumption of uranium mining comes only days after Australia’s newest uranium mine, Four Mile in South Australia, officially opened on 25 June. Yet the price of uranium has fallen from a high in 2007 of US$70 a pound to $US28, due to factors including oversupplyand what the Wall Street Journal has described as a “post-Fukushima funk”. Given the prices are so low that The Australian has reportedthat Four Mile is already losing money, while the Beverley mine has been mothballed since January, why are Australian states looking to open more mines?…………. The highest concentration of Queensland’s uranium mines sit in the northern tropics, an area prone to Category 5 cyclones. A 2013 Swiss study found uranium was far more mobile than originally thought. Uranium once extracted, becomes soluble in water, increasing the chances of contamination or radioactive dust carried in high winds and heavy rainfall. If Ben Lomond is reopened, the quickest way to export its uranium would be through the city of Townsville, home to 190,000 people, which is only 50km from the mine. Queensland’s efforts should be [put] on facilitating the use of existing ports and shipping lanes by industry for the export of uranium. However, the Port of Townsville sits within the Great Barrier Reef World Heritage Area and close to sensitive environments including the Great Barrier Reef Marine Park, dugong protected areas, seagrass beds, fringing coral reefs and mangrove forests. I think shipping of any toxic cargo would be of concern. But really we would have to see a proposal and we would have to consider that. So this is set to be a contentious issue: while economic development of the north has bipartisan support at a federal, state and local government level, a number of locals and environmental groups have said they will challenge any plans to reopen uranium mines and exports from Queensland.